← ‘camexpo’ newsletter features my article: Are you converting enough beta carotene to Vitamin A? Flaxseed crackers are a really amazing creation. They are gluten free, contain a good amount of protein and are full of fibre. 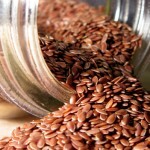 They contain ALA, which is a type of omega 3, and as flaxseed is low in available carbohydrates they will also have a low glycemic index. What else could you wish for in a cracker? NB – this is for a slightly spicy cracker, see below for a more Mediterranean flavour with tomato, olive oil and herbs. Preheat the oven to 75 C. Flaxseed crackers are traditionally done in a dehydrator and not heated above 42 C so that they are classified as ‘raw foods’. These crackers will not technically be raw if they are cooked at 75 C in the oven, but they will still be a very healthy cracker. Take two baking trays and line them both with greaseproof paper. Fold the paper over so that you have a double layer on the tray. Grease the upper layer. Mix all of the ingredients together in a blender, with a few short bursts. Divide the mixture onto the two trays and spread it over the greaseproof paper until it is just a few millimetres thick. Place in the oven for about 2 hours, or until the top of the cracker sheet has dried out. 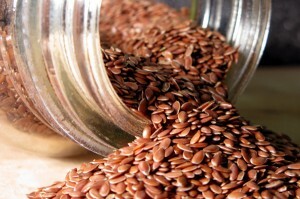 Try to loosen or peel off the paper from the flaxseed sheet. If you cannot do this then leave it to dry out in the oven for a little longer. Unfold the paper and grease the other side of it. Use scissors to cut the layer into crackers and place them, moist side up, on the newly greased side of the paper. Put back in the oven for another 2 hours, or as long as it takes for the crackers to become completely dehydrated and stiff. Once cool, store in an air tight food container. They will be fine for a couple of weeks. Flaxseed crackers go really well with kimchi, a spicy korean sauerkraut, or with another fermented recipe, gingered carrots. They are also great with humus, tahini, avocado and other dips and spreads. The recipe above is for a slightly spicy flaxseed cracker. You could try adding tomatoes, dried or fresh herbs such as basil, a dash of olive oil and a clove of garlic, instead of using the spices for a more Italian flavour.